In this third installment to the series about Fern, her friend and "brother" Howard, and the magic hidden in books, Fern and Howard must flee from their parents when the Drudgers decide to send them to military academy and the Blue Queen makes her move on the kingdom, located underground, under the city of New York. The series has lost a bit of its lustre as it continues. The latest installment is more clunky and heavy-handed but most of all the novelty of books springing to life has declined. The message this time is about the sacrifices that writers make to create stories that transport you, but it is a message delivered with a sledgehammer. This time, the author has forgotten to liberally spread the joy and fun around that was in the previous books (replacing it with weirdness and unpredictable and meaningless plot twists). 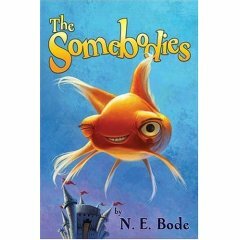 Re-read The Anybodies and give the sequels a pass!